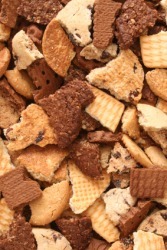 A pile of broken cookies. The definition of broken is split, out of order, or not continuous. An example of broken used as an adjective is the phrase "a broken home," which means a home where the father and mother are not living together. An example of broken used as an adjective is the phrase "broken watch," which means a watch that is not keeping accurate time. "broken." YourDictionary, n.d. Web. 21 April 2019. <https://www.yourdictionary.com/Broken>. split or cracked into pieces; splintered, fractured, burst, etc. Forcibly separated into two or more pieces; fractured: a broken arm; broken glass. Sundered by divorce, separation, or desertion of a parent or parents: children from broken homes; a broken marriage. Having been violated: a broken promise. Topographically rough; uneven: broken terrain. Crushed by grief: died of a broken heart. Not functioning; out of order: a broken washing machine. (of a promise, etc) Breeched; violated; not kept. I think my doorbell broken. (pejorative, of language) Grammatically non-standard, especially as a result of being a non-native speaker. (pejorative, politically incorrect) Torres Strait Creole. You don't sound very broken up about it. He'd chosen to stay with her that long, and she'd broken Immortal laws to take her place as his mate. The case was broken and the keys are nearly all out.